However, the mobile explosion presents a problem for many businesses. Research shows that users whose mobile web experiences aren’t functional, fast, and easy to navigate will get frustrated quickly.2 A poor mobile experience risks loss of business and can do serious damage to a company’s brand. 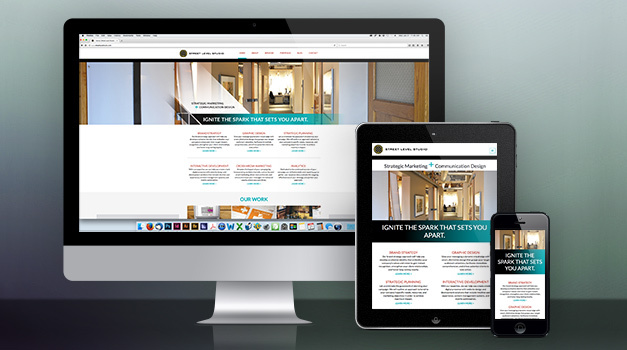 Marketing and design teams are increasingly turning to responsive design to solve this problem. Instead of creating multiple sites for each viewing format, responsive design aims to create one website that reformats itself according to the user’s device. This flexibility makes browsing simple and clear in any platform and saves the time and money needed to manage multiple sites. How does responsive design display in practice? You’re looking at it. Whether you’re reading this on a desktop, laptop, or mobile device, all of the content is optimized for your browser and device’s resolution, size, and display. We were excited to add this capability during our recent website redesign in 2014. The responsive sites and emails we’ve created for clients are proof that this design trend can be both useful and powerful. Responsive design allows users to engage in an online experience without the interruption of endless scrolling and pinch-to-zoom navigation, whether that means finding a video, reading an article, or making a purchase. In addition, it allows businesses to communicate and reach their clients effectively.